Camellias are perennial flowering shrubs native to Eastern and South Asia. The camellia flower is the state flower of Alabama and a common sight in Southern flower gardens. Camellias are evergreen and produce large, showy flowers in late fall, winter or early spring, which can grow up to 5 inches in diameter. They are easy to care for once established, and will flower for many years when properly maintained. Plant camellias in late fall or early winter when temperatures are still above freezing. Choose an area with partial shade and well-drained but moisture retentive acidic soil. Work several inches of organic compost into the soil before planting for the best results. Camellias will not tolerate full sun, full shade or windy areas. Spread a 2 to 4 inch layer of mulch over the roots of camellia plants to provide a uniform soil temperature and moisture level. Camellias have a shallow root system, and mulching is the perfect way to protect the roots from drying. Water camellias at least once per week, and more often during dry periods. Soak the soil to a depth of at least 15 inches, and water again when the top few inches of the soil around the roots begins to dry. Camellias are susceptible to drought damage due to shallow roots, so check the soil regularly to maintain proper moisture. Fertilize camellia plants beginning in the second year of growth. Apply 1 level tbsp. 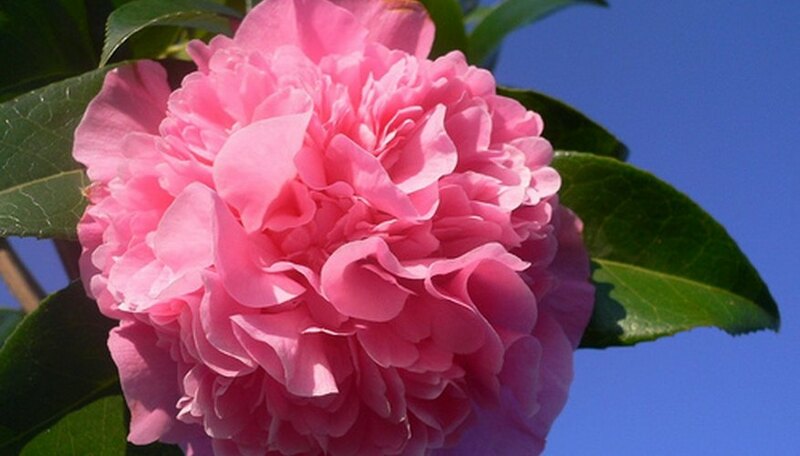 of camellia fertilizer per foot of plant height in March, May and July for the best results. Spread the fertilizer evenly on top of the soil around the plant and continue several inches in all directions beyond the drip line. Water thoroughly after fertilizing. Prune camellias after blooming in spring and early summer, but before new flower buds form. Little pruning is necessary, even in established plants, but you may need to remove dead wood and thin inner branches to promote air circulation. Do not prune heavily, as camellia plants are slow growing. Shredded bark mulch, leaves or pine needles are appropriate mulches for camellias. Specially formulated camellia fertilizers are available at most home and garden retail stores. If unavailable, any 8-8-8 or 10-10-10 NPK fertilizer may be used with similar results. Do not exceed the manufacturer's recommendations for fertilizer application, as camellia's roots are easily burned by over fertilization. Why Are My Camellias Turning Brown? How Often Do You Fertilize Camelias?